After a water break we continued tasting four Santa Lucia Highland Pinots. While tasting with Ted and Shannon and others in Los Olivos I met a character in the The Los Olivos Tasting Room & Wine Shop. He gruffly expressed his strong opinions on Pinots, one of which was that Santa Lucia Highland produced the best Pinots. Given I haven't explored much of the Pinots in the region, I thought this would be the perfect opportunity to give some a try. It was my birthday, which excused the K&L bill and besides, The Emperor of Pinot demanded it, or so I told Sue. C - 2013 Kosta Browne, Rosella's Vineyard came in first place with an average of 3.70. D - 2015 Kosta Browne, Pisoni Vineyard came in second place with an average of 3.64. 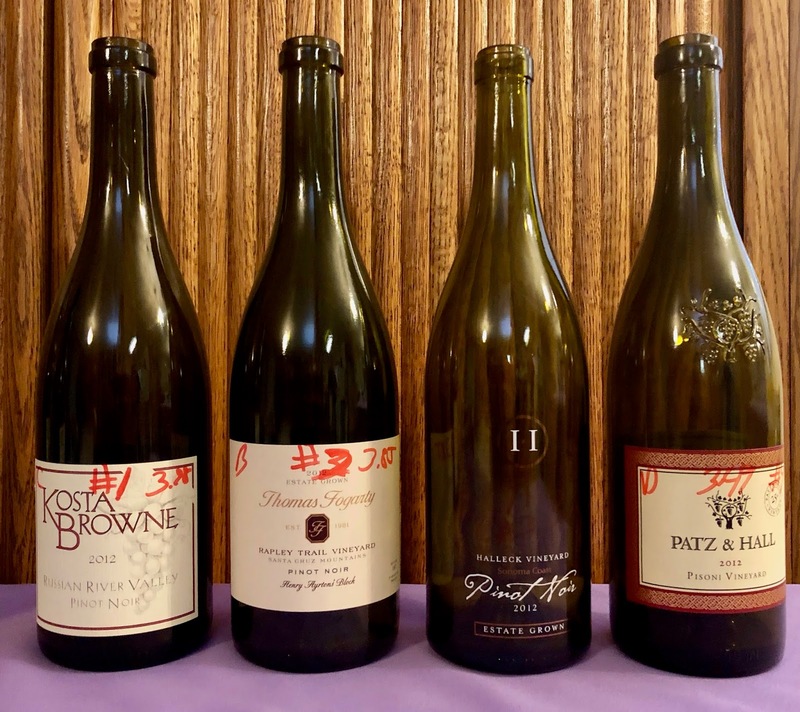 A - 2012 Kosta Browne, Gary's Vineyard came in third place with an average of 3.29. 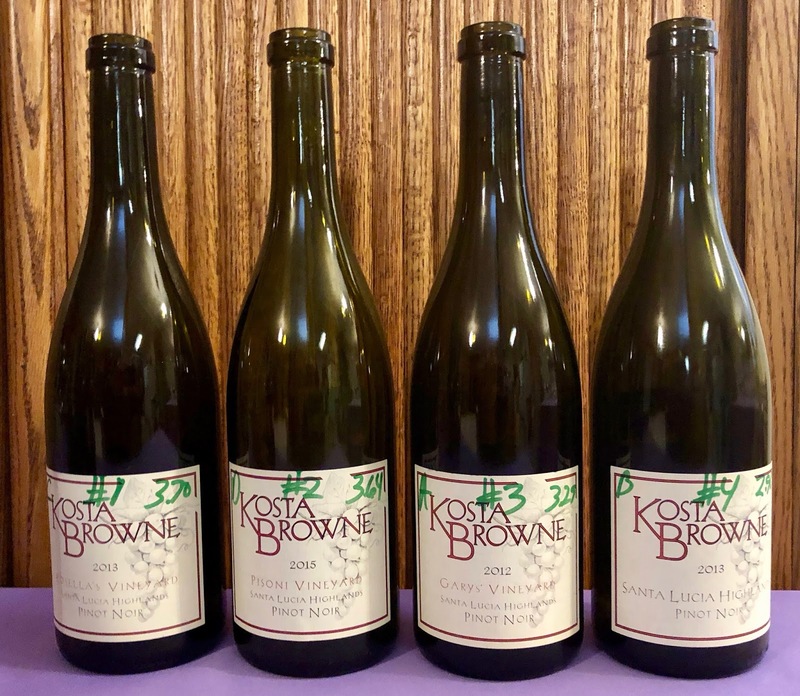 B - 2013 Kosta Browne, Santa Lucia Highlands came in last place with an average of 2.96. 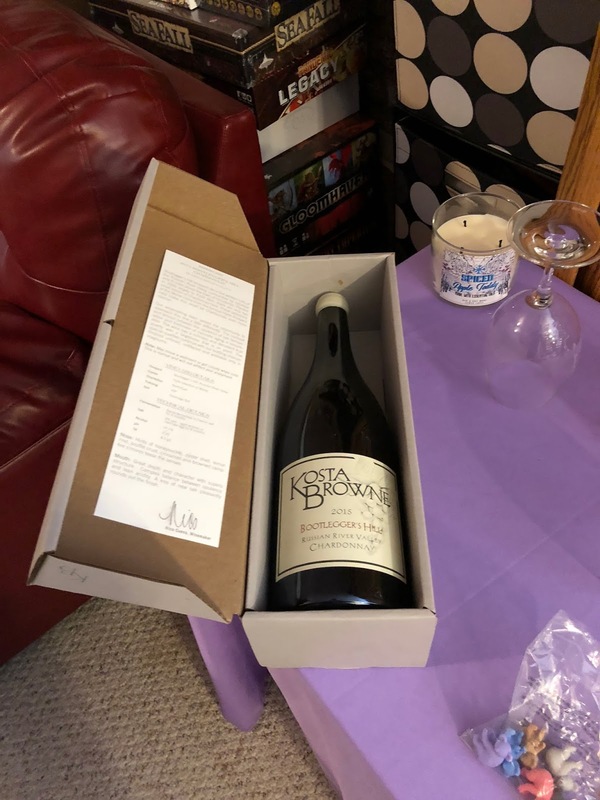 I didn't set out to taste only Kosta Browne SLHs, but I wanted all the well known vineyards, all with a similar, drinkable vintage. These seemed the best options K&L had. As planned, I brought out the Pinots we tasted at my 45th to taste again, 3 years older. Unfortunately, we had to set up inside due to the rain and cold. My birthday is alway hit or miss weather-wise. It's a little cozy indoors, but we make it work. Plying everyone with wine can't hurt this cause. 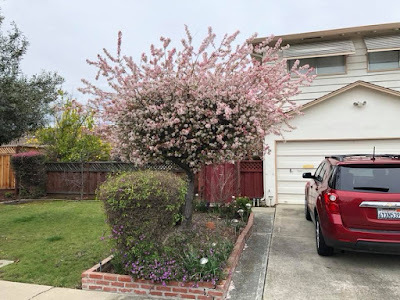 The tree out front was certain it was spring and cheerfully greeted our guests. We started off with one of the Kosta Browne 20th anniversary wines: A magnum of 2015 Bootlegger's Hill, Russian River Valley, Chardonnay. It was a beautiful wine with a surprising amount of schmutz at the bottom for a white. Its dark color surprised me given it's age. Is this a result of the oak fermentation? It was interesting to read Bootlegger's Hill is a selection of Wente clone from the Hyde Vineyard. 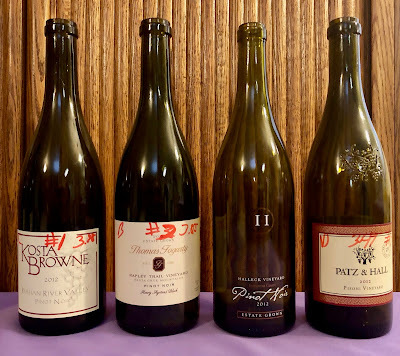 The Patz & Hall, Hyde, Chardonnay is one of my favorites. I'll have to investigate what clones it uses. 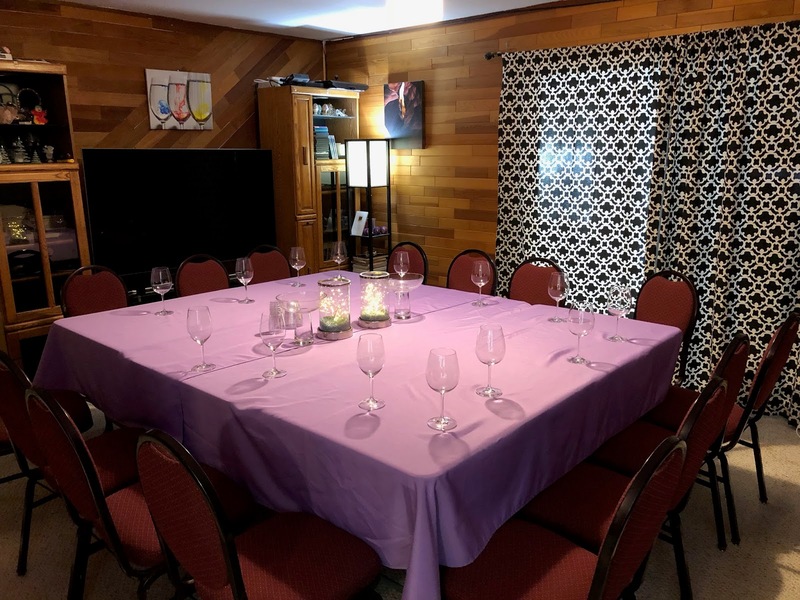 We tasted the four Pinots while Sue filled us with bacon wrapped potatoes and pot stickers. 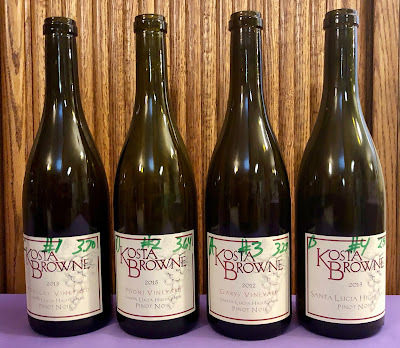 C - 2012 Kosta Browne, Russian River Valley came in first place with an average of 3.98. B - 2012 Thomas Fogarty, Rapley Trail, Henry Ayrtons’ Block, Santa Cruz Mountains came in second place with an average of 3.85. A - 2012 Halleck Vineyard, Estate, Sonoma Coast came in third place with an average of 3.65. D - 2012 Patz & Hall, Pisoni Vineyard, Santa Lucia Highlands came in last place with an average of 3.49. Amazingly the Kosta Browne took first as it did in the original tasting. The average rating improved from 2.98 to 3.74. The bottles were pretty young when we originally tried them. Three years later, it was hard to pick a winner.